The restaurant is open for lunch and dinner from Friday to Sunday. In Altrocanto we offer a zero-kilometers restaurant, in a relaxed and laid-back environment, where you will sense in equal measure cure and familiarity. For our preparations we only use seasonal products from small local producers, flours and olive oil of the region, strictly Abruzzo wines and preferably organic ones. 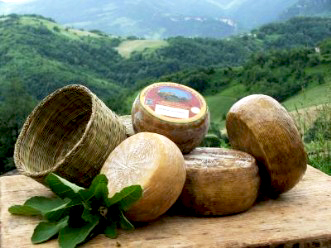 The non-local products are provided by Fair Trade, Solidal Trade and Libera Terra (organic productions produced on confiscated mafia land). In this way we try to give our small contribution to the territory and sustain an active and responsible interaction. Raw materials from Abruzzo for borderless recipes. Our menu is very succinct, usually you can choose between two options of appetizers, first courses, main courses and desserts. It varies every two weeks, but may also include substitutions or new dishes, even daily, following the availability of local products and above all the creativity of the chef. The basis for this choice is the desire to pre-empt the flavour authenticity, the rediscovery of local products, niche, often excluded from large distribution and why not, even to reduce waste, avoiding the accumulation of large stock of food. Instead of filling the freezers, we prefer, as good housekeepers do, to go several times a week to our trusted butcher, or to the quaint Farmer’s Market in Penne, or to the dairy, or to Mrs. Luciana to pick up the renowned Pecorino di Farindola. We are therefore trying to build and carry on a direct human relationship with our suppliers, which is rewarding and also very valuable, considering that the best culinary tips almost always comes from the raw material producers, like those from the fantastic ladies of the market! Our menu includes both meat and vegetarian meals and if we get noticed in advance, we can also satisfy our vegan friends. In an embracing and cozy room with a slight musical accompaniment, we can accommodate up to 25 guests at our 7 tables. We accept Visa and Mastercard and Satispay.